To begin this piece about the day out at Parlington in the 1930's it is worth noting that around that time according to a research paper by Mette Eggen, [a research student from Norway, studying the gardens at Lotherton Hall] the Porche Cochère was removed and re-erected at Lotherton to form a feature for the Parlington Garden. The header picture here shows the ladies enjoying a ride the farm shire horses, used in those times to power most farm activities. The group have been joined by a small boy who is hanging on to the horse on the left. Also the group has now increased to five ladies, suggesting that the earlier picture at the Triumphal Arch was taken by the lady seated behind on the horse on the right, as she does not appear on that photograph. Behind the group can be seen a stone wall, which looks as if it is one of the enclosures called the stallion pens, just down the hill from the arch towards Home Farm. 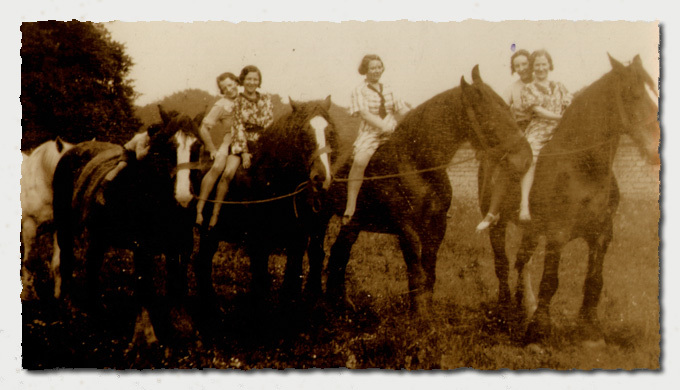 The horses are tethered to one another suggesting that the group had mounted the horses to have the photograph taken. The stone walls as seen in the header picture. 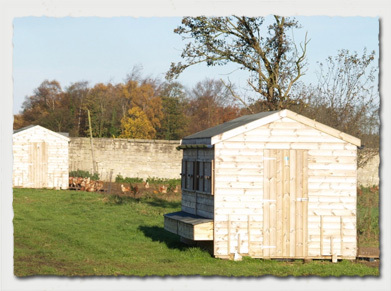 The enclosed pens make excellent locations for free range hens, so if you are local to Parlington, you can purchase some very good eggs from the farm!